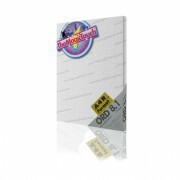 Drafting / Plotting Flim is a 75 micron transluscent double matt polyester film, compatible with most inks and pencil leads. The tough surface will take repeated erasure without ghosting and also incorperates an antistatic treatment to avoid dust attraction. The polyester film base will withstand rough handling and has excellent archival properties.